Maybe you’re thinking…”I need a new toilet to replace the leaky, old, water-wasting, don’t wanna flush right, runs all night, cold & skinny seat, gotta push the handle down myself… toilet I’ve got now. Lucky for you I just happen to have a few of the latest design trends and HET’s to show you that appeared at the 2007 Kitchen and Bath Industry Show in Las Vegas recently. I think you’ll be pleased with some of the latest toilet designs that are likely to cause a stir in the near future. 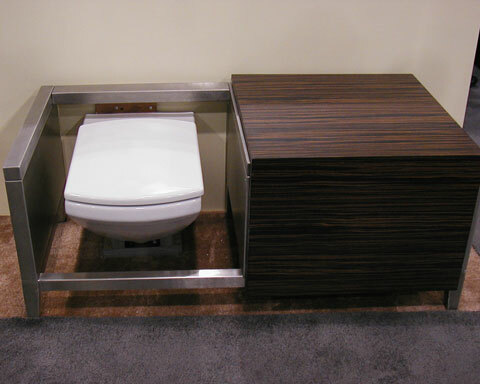 The catalyst behind many of the design trends and functions from this years’ KBIS were more contemporary and Asian-inspired designs, as well as improved toilet performance and water conservation. That’s a lot of water and it hardly seems possible, but the numbers don’t lie. I think back through a typical day for me and I can’t come up with 100 gallons, maybe 40-50 gallons, but then again it’s an average. They would have to figure in all of the industries that use water to produce the products we buy, as well. The U.S. Environmental Protection Agency (EPA) has come up with a new program to label water-efficient toilets with the WaterSense label for consumers as an easier way to know if they are purchasing a High Efficient Toilet. 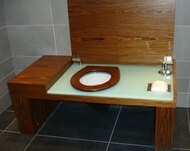 These HET’s perform as good as, if not better than, today’s conventional toilets while conserving water in the process. It’s a win-win for consumer and Mother Earth alike. You won’t see the WaterSense label on toilets in stores until the latter part of 2007. The Brisbane by Caroma (below) and the Murano by Neptune, a dual-flush toilet, are 2 offerings that are certified HET’s. Kohler has a great selection of high efficient toilets. Click on the Kohler HET link and select the gallons per flush models that you’re interested in. Mansfield has a good selection of HET’s to suit your needs. TOTOUSA has superior engineering so check them out. There were even a couple of hide-away toilets appearing at the show that look like a bench. They are the Julien Bathroom Suite by Troy Adams (below left) and the City Life SmartBench by Villeroy & Boch (below right). The TOTO Ryohan (below left) and Vitra’s Istanbul styled toilet and bidet (below right). Photos via BuilderOnline except for top photo by Big Rock Cabin. Sidenote: Big Rock Cabin looks like a nice getaway located in southern Ohio. …see what I mean…real world! There is also a (very handy) compiled list of toilet manufacturers with website addresses and phone numbers listed on the left. Do you have any interest in manufacturers of composting toilets or electric-incinerating toilets? They’re listed on Terry Love’s toilet review site, too. A narrative tour of the bathrooms of the Bill Gates’ mansion.